It’s always great to see Bon Jovi, and Jon Bon Jovi in back in the news and seeing the band still rocking large stadiums like they’ve always done before. Tonight was no different except the venue was American Idol and the stage was not only the thousands of fans who were there live, but also the millions of people who were watching Bon Jovi while watching American Idol on TV. 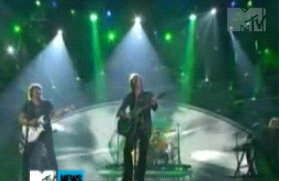 (From MTV.com) Bon Jovi performed a blaring rendition of “Superman Tonight,” the second single from their 11th studio album, The Circle. In the past, frontman Jon Bon Jovi has described the song as “something like a diary of the observer, and I’m just the fly on the wall,” providing a suitable context for the musician’s role on Wednesday night’s (May 12) “American Idol”: While Bon Jovi himself is used to taking center stage, even his rocking presence couldn’t fully alleviate the crowd’s anxiety over who would be going home next, an unfortunate distinction that ultimately fell upon Lynche. Asked how Bon Jovi are able to replicate their success year after year, Jon replied: “You know, hard work and good luck. Good friends who have put us in the right places. What did you think of Bon Jovi tonight on American Idol? So what did you think about tonight’s performance by Bon Jovi? Did you think this was classic Bon Jovi material or what? And what about Jon Bon Jovi himself?